The Magical Approach (eBook) - Amber-Allen Publishing, Inc. 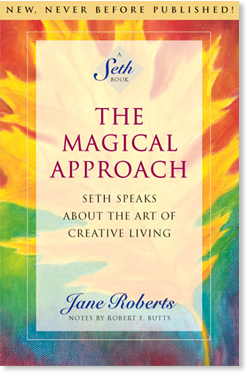 In The Magical Approach, Seth invites us to look at the world through another lens — a magical one. Seth reveals the true, magical nature of our deepest levels of being, and explains how we have allowed it to become inhibited by our own beliefs and conventional thinking. The Magical Approach teaches us how to live our lives spontaneously, creatively, and according to our own natural rhythms. It helps us to discover and tune into our natural, instinctive behavior. By applying the principles in this book, readers will learn to trust their impulses and discover the highest expression of their creativity. There is much material here that I will give you, because it is important that you understand the different ways of relating to reality, and how those ways create the experienced events. The “magical approach” means that you actually change your methods of dealing with problems, achieving goals, and satisfying means. You change over to the methods of the natural person. They are indeed, then, a part of your private experience. They are not esoteric methods, but you must be convinced that they are the natural methods by which man is meant to handle his problems and approach his challenges. I use the word “methods” because you understand it, but actually we are speaking about an approach to life, a magical or natural approach to life that is man’s version of the animal’s natural instinctive behavior in the universe. That approach does indeed fly in direct contradiction to the learned methods you have been taught. You have held on to those methods to varying degrees, since after all it seems that the world shares them. They are understood ways of dealing with events. . . . Assembly line time does not really value time — only as time can be used for definite prescribed purposes. In that framework, to enjoy time becomes a weakness or a vice, and both of you to some extent have so considered time. With creative people strongly gifted, as in your cases, the natural person is very prominent, no matter what you do. It therefore strongly resents any basically meaningless constraints placed about its experience. It knows, for example, how to enjoy each day, how to collect creative insights from each and every encounter, how to enrich itself physically through household chores or other activities. It dislikes being told that it must work thus and so at command of unreasonable restraints. The natural person is anything but irrational. It gathers all of experience together and transforms it, so many of your problems have been caused by applying the wrong kind of orientation to your lives and activities. I say wrong, meaning no moral judgment, but the application of one method to a pursuit that cannot be adequately expressed in such a fashion. The assembly-line time and the beliefs that go along with it have given you many benefits as a society, but it should not be forgotten that the entire framework was initially set up to cut down on impulses, creative thought, or any other activities that would lead to anything but the mindless repetition of one act after another. In other words, that entire framework is meant to give you a standardized, mass-produced version of reality. None of its concepts can rationally be applied to creative endeavors. The orientation that gives you the creative achievement lies in the opposite direction. Creativity itself has its own built-in discipline, the kind that, for example, in a dream can rummage through the days of the future to find precisely the data required to make a specific point. A Day in which Magic Comes to Life and Seth Describes What “The Magical Approach” to Life Is. Assembly-line Time Versus Natural, Creative Time. The Rational Mind Versus the Artistic Mind. The Rational Approach. Scientific Hardbed Reality. The Intellect and the Magical Approach. Man and Other Species. Mistakes as Corrective Action. Definition of the Magical Approach. Science and Science’s Picture. Desire as Action. Styles of Thought. Combining the Magical Approach and the So-called Rational Approach. Animals and Reasoning. Things Beyond One’s Control. The Intellect as a Cultural Artifact. Creating One’s Own Experience. Nature as Man’s Caretaker. Natural Magical Reasoning and Trust. The Body’s Reasoning as Logic. Belief Systems. Education and Culture. The Natural Person. Rob Using the Magical Approach. Precognition. The Self. Relaxation and Effortlessness. The Natural Person and the Natural Use of Time. Jane’s Skill as Ancient as Man Is. The Species’ Multitudinous Abilities. Appendix A: Three of Jane’s Adventures in Prediction Seth’s Comments. Jane’s Contents of the Mind. Appendix B: Magical Orientations and the Motions of Probabilities. Jane’s Mental Conversation. Appendix D: Jane’s Challenges with Her Scope of Identity vs. The Scientific Community.